to connect the Atlantik V2.X to your Home Wi Fi router you must follow the 11 steps. 1. Turn OFF all units. 2. Turn ON only the first unit you will connect. 3. In your tablet choose the wifi-socket. 4. Open Chrome from your tablet and type 192.168.1.100 in the address bar. 6. Change mode to Sat. 9. Go to system in the main menu, and click restart. 10. Go to wifi setting again and change to your network router SSID. 11. go the Orphek app and do search id, it should find the first unit. Then do from 1 to 11 for the remaining units. Turn ON only the first unit you will connect. In your tablet go to settings, wifi and connect to the wifi-socket. Make sure the slider button on the left of the screen is turned on (Wifi on/off). Open your browser on your tablet and type 192.168.1.100 in the address bar. The UART-WIFI set up screen should be displayed. For user name type in admin, the password is 000000. In the SSID box you will type in your network name. This is case sensitive so be sure to use capital or small letters so it is correct. In the encryption key box, type in your network password. 7. SSID : Put your Router Wi-Fi Network Name ( SSID Name ). Select /Keep ,disable in the encryption box (do not confuse with encryption key box). 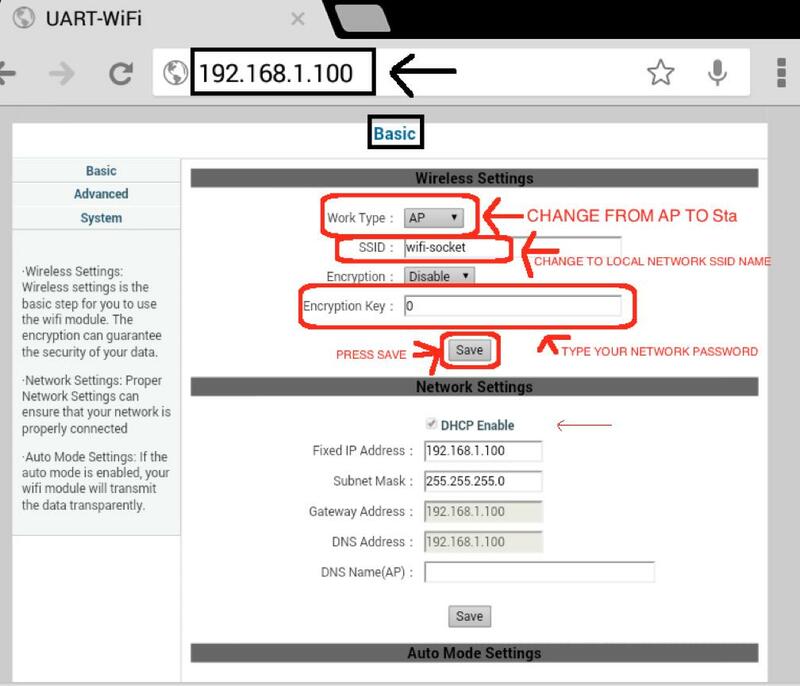 Your tablet will automatically find the encryption key if your router supports it. 9. In the upper left of the UART screen you will a choice of Basic, Advanced, and System. Click on system TAB and in the first section of this page you will see a restart button. Press the restart button. A window appear saying the browser cannot connect to the IP address. This is fine because You should need to connect to your router SSID. 10. 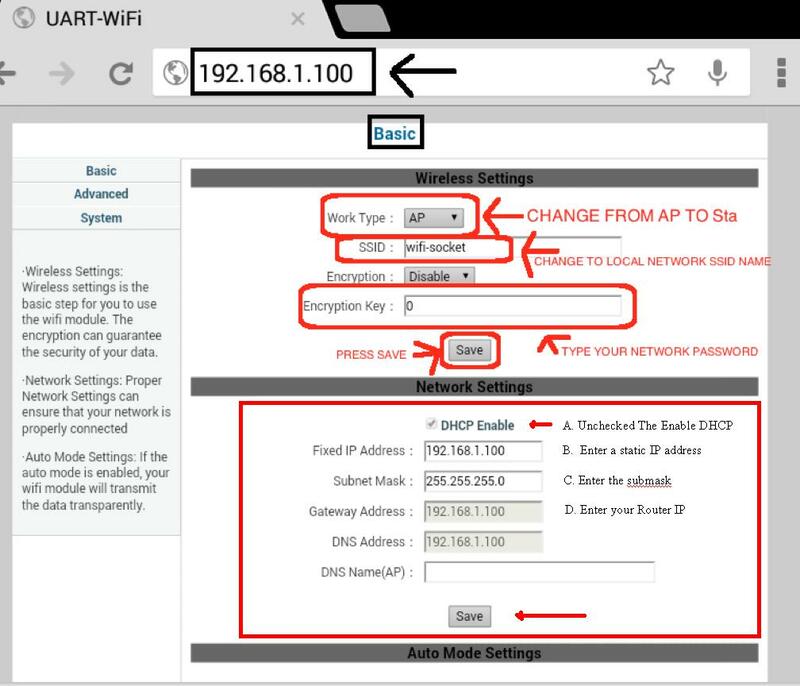 On your tablet /Phone connect to your wi-fi Router network SSID. 11.Open the Orphek app and click the clear button on the upper right of the screen. Now click the search button located on the upper left of the screen. Your network should find the tablet and your new IP address for your Orphek light should appear. Repeat steps 1 to 11 for the remaining Orphek units. IF your router is 100.168.20.1, then you can enter 100.168.20.2 or any IP between .2 and .254. C. You should also enter the submask and in most cases it is 255.255.255.0. E. Then do the same to the remaining units. BUT etch unit must have unique IP address . 11. Go to system in the main menu, and click restart. 12. go the Orphek app and do search id, it should find the first unit. 12. go the Orphek app and do search id, it should find unit 2 . 2. access wifi-socket wifi connection to light. 6. hit save in top section. 7. Hit save in bottom section. 9 Light will reboot, wifi-socket will disappear and Unit will be renamed to what you typed in SSID box. 10. Turn on the next light and begin the process again choosing a different name for SSID.